Growing security concerns, surging traffic congestion issues coupled with increase in sale of vehicles in the country are some of the key reasons factors that are resulting in the overall growth of the Intelligent Transportation systems in the UAE. Further, with the increase in demand for smart vehicles and internet of things, the market of Intelligent Transportation System is expected to register healthy growth over the next six years. Advanced Transportation Management System, accounted for the major revenue share in the UAE market owing to increase in installation in traffic control system. In the UAE region, northern region held major market for Intelligent Transportation systems in terms of revenues on the back of increasing infrastructure development activities in the region. For Instance, a 27% surge in the infrastructural spending by UAE's government budget in 2017 would create more number of projects in the transportation sector. Northern region is expected to maintain its market share during the forecast period as well. The report thoroughly covers the UAE Intelligent Transportation System market by types, verticals and regions. The report provides an unbiased and detailed analysis of the on-going trends, opportunities high growth areas, market drivers which would help the stakeholders to device and align their market strategies according to the current and future market dynamics. 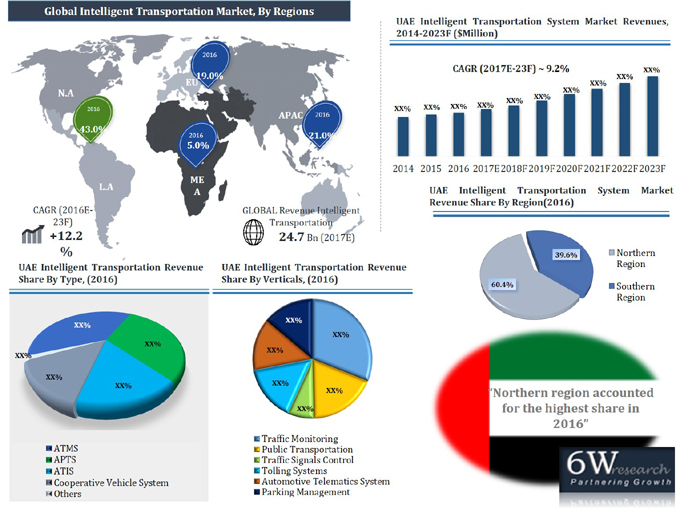 • Historic data of UAE Intelligent Transportation Market Revenues 2014-2016. • Historic data of UAE Advanced Transportation Management System Market Revenues 2014-2016. 11.3. General Electric International Inc.
11.7. Nuance Communications Ireland Ltd.